PYEONGCHANG, South Korea (AP) — An army of high-flying drones expected to light up the sky at the opening ceremony of the Olympics was grounded. Viewers of NBC's tape-delayed broadcast in the United States still saw it, but it was a pre-recorded version. Intel Corp. was expected to launch 300 drones as part of an extravagant light show, but those plans were scrapped. 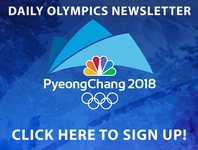 International Olympic Committee spokesman Mark Adams said Saturday that the drones were not deployed Friday night because of an "impromptu logistical change." NBC aired a light show, but it was from Intel's launching of more than 1,200 drones in December in Pyeongchang. That didn't keep the television network from highlighting the moment. NBC tweeted on its official @NBCOlympics page: "A swarm of drones brings us one of the most incredible sights of the #OpeningCeremony." Intel celebrated breaking a Guinness World Record for the most drones flown simultaneously by tweeting a link to the video . "More than 1,200 drones," the Santa Clara, California-based company tweeted. "One amazing show. See how our drone team pulled off a Guinness World Records title for the Opening Ceremony."